In this tutorial you will learn how to prepare .gcode file for printing good quality vase-type model. Vase-type model is a model that has bottom, outlines and no top. It can be made from any solid model, if you prepare the file appropriately. First of all start your Voxelizer software and click “designfutures download”. 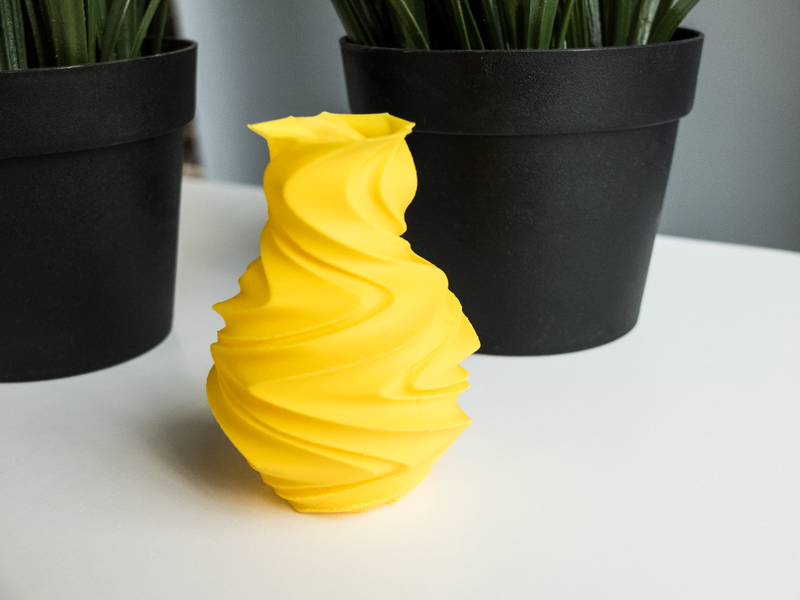 Find Spiralized Hex Vase model and click “open stl” (you can of course use any other vase model available online). Wait for the software to finish downloading. Now scale and rotate the model as you wish and click “VOXELIZE”. After voxelization process is finished you will be automatically moved to next part of file preparation: voxel editor. In the beginning choose preset you would like to start with. Since most popular is 1.75 Plastic Extruder, we will choose 1.75mm filament preset. Now expand advanced settings of printing by ticking “show advanced”. Now, in the “general” sub-menu change “layer height”. The lower the layer, the better the smoothness of surface, but it can’t be too low. Commonly used are layers of height between 0.1-0.3mm. Also the layer height shouldn’t be higher than 75% of nozzle diameter. Also turn off the retraction (untick box next to “retraction on”). When printing vases retraction is not necessary because we will print outlines only that will begin in the same spot (but you can leave it also at default values). Next, switch to “outline” tab. Change the outline count to either 3 or 4 (this particular vase model needs more outlines than usual because of its geometry). Also change “start position” to last position. This will generate outlines of the layer starting in the same position as last layer so the seam won’t be visible. Now go to “infill” sub-menu. Change the “infill ratio” to 0% (vase should be empty inside). Also change “top solid depth”, “bottom solid depth” and “solid depth” to 0. These options are responsible for upper surfaces of print. Switch to the last tab - “project”. Change the “bottom layer base” to either box (for printing with PLA and its derivatives) or power raft ABS (for printing with materials requiring adhesion layers). Now you can inspect layers of your print using slider on the right side of the screen. Last step to do is to click GENERATE GCODE, and when the software finishes working, print your file either via USB cable through Voxelizer, or from internal/external SD card of your machine. If instead of vase, you would like to print hollow object, set only “infill ratio” to 0%, rest of the settings leave as they are (or make top/bottom solid depth thicker). Vase you will print will most likely leak when filled with water. If you want to make it water-tight, add more outlines (5-6) and add more “solid bottom layers” in infill tab (5-6). Also rise the value of “path width” in general tab to 0.5-0.55mm (when printing with 0.4 nozzle). 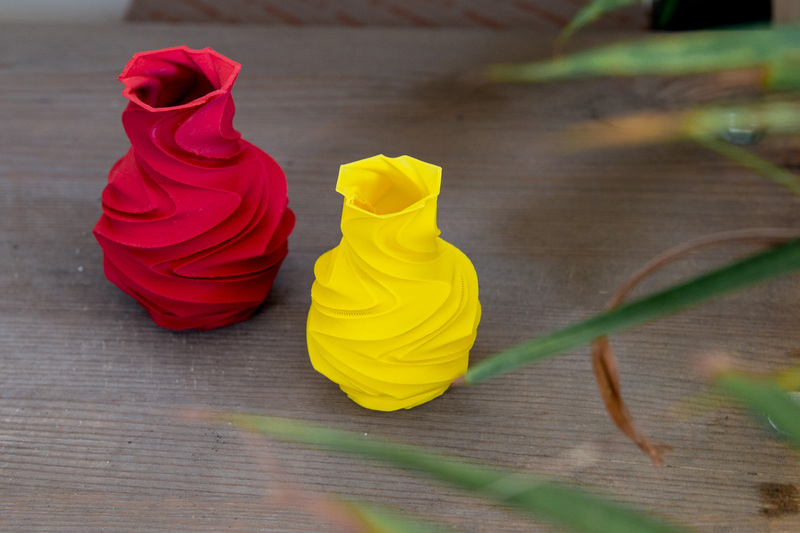 Vases are usually easier to print when using PLA filament (or its derivatives) with strong cooling. You can also download ready for printing .gcode file below.